There really are nightmares and sweet dreams too. The sweet dreams, ‘dulce sueno’ are the ones that come when we’re carefree, like a little girl who dreams of candy, jewels and colors. Where as an adult may have a nightmare portraying their anxiety. “The Nightmare Before Christmas” examines, in a colorful animated children’s story with claymation from Tim Burton, a character by the name of “Jack”. Jack’s obsession comes from his inability to be part of the festivities of Christmas town. Jack’s the king of Halloween town, but is obsessed with the spirit of Christmas. Thus, he plans to kidnap Santa Claus so that he can replace him by bring joy to the children on Christmas morning. However, he forgets who he is, he brings fright and panic to the trick or treaters. He transfers these frightful gift ideas and the result is a horrific failure because the children are expecting their dolls and toys, instead they receive headless dolls or snakes instead of stuffed animals. Jack sees this disaster and is horrified. He finally realizes he belongs to Halloween town with Sally, his longtime friend who is worried about him. He decides to leave Christmas town to Santa. 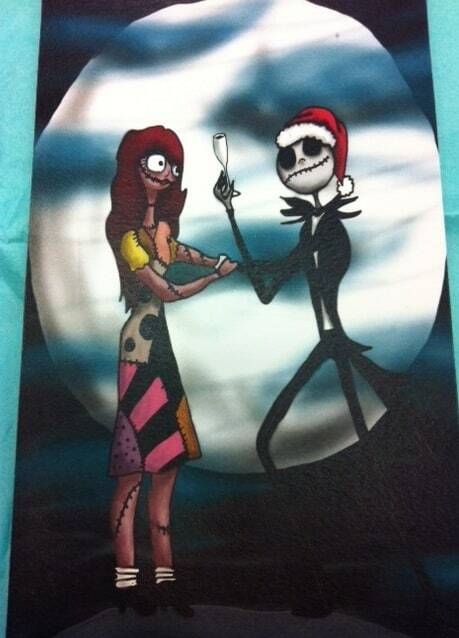 Our client Donna, worked with us to create a custom “Nightmare Before Christmas Holiday Card“, so we worked with our custom printer, K Paper who uses a silkscreen technique to come up with the following invitation. 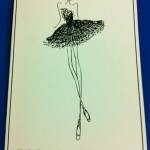 Our client provided the artwork which her friend, Lali, had designed. Since Donna is a red head, this worked great using Donna as Sally. Lali also included a toasting glass where Jack’s saluting to Donna (Sally’s character). The invitation is printed in red thermography on cream paper, the rsvp is on red stock with silver thermography. All the stationery are tied together with a red ribbon. 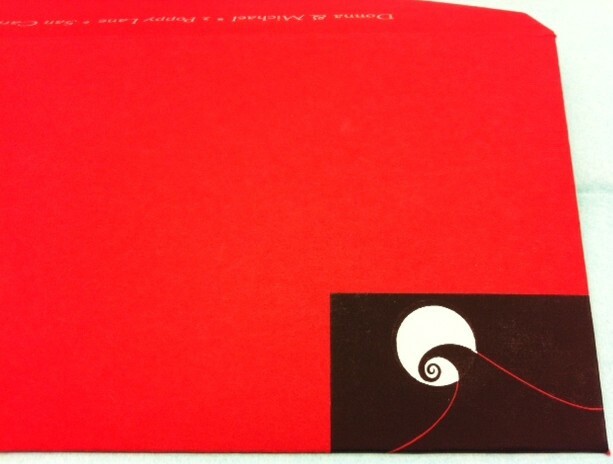 The invitation envelope is in a matching red stock with The Nightmare Before Christmas art work added as an extra detail. The rsvp envelope is in cream stock the address printed in red ink. 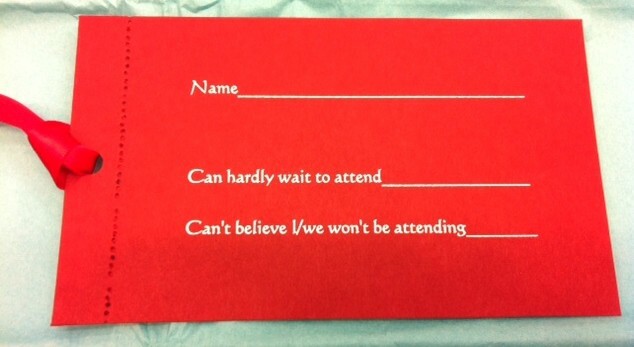 The above rsvp card is red with silver thermography printing, “can hardly wait…/can’t believe I/we won’t be attending…” You can see the Red Thermography Addressed Rsvp Envelope on our previous blog post. We also addressed Donna’s envelopes with Hyegraph’s Digital Calligraphy. You can see more original invitations we helped design for Donna using K Paper. We created her Custom Scroll Wedding Invitation and Wedding Save the Dates! 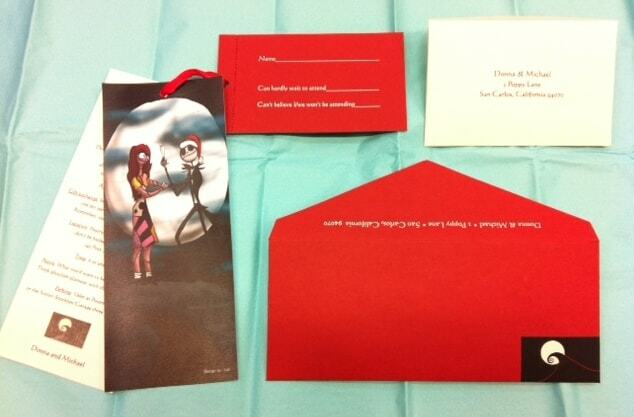 The above RED Custom Invitation Envelope is beautiful with silkscreen Nightmare Before Christmas Original Art Work Design in black and the yellow moon. Donna’s return address is printed on the envelope flap using again the silkscreen printing technique. 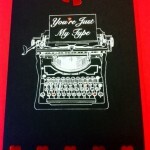 See more of our Custom Invitations on our Wedding Website and Wedding Blog. I sense there’s something in the wind, That feels like tragedy’s at hand. And though I’d like to stand by him, Can’t shake this feeling that I have. The worst is just around the bend, And does he notice my feelings for him. And will he see, how much he means to me? I think it’s not to be. What will become of my dear friend, Where will his actions lead us then?… And will we ever end up together?